Climat change is an increasingly complex topic. 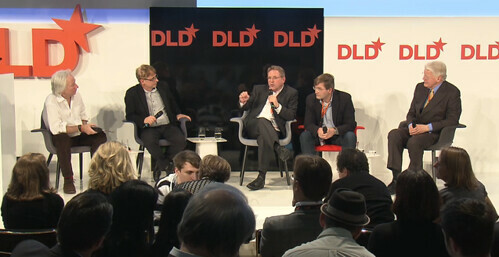 At DLD13 it is discussed by a panel coming from politics, media and science. The Icelandic President Olafur Ragnar Grimsson warns that we need to take climate change seriously with a global approach. David Kenny from Weather Channel agrees and points out that the extreme weathers are a global phenomenon and we need to connect the changing patterns of weather. "The real question is about the economy and politics" says Johannes Meier from the European Climate Foundation. "You don't really get elected if you do something for the people in Bangladesh if your electorate is in Europe." President Grimsson's offer for a solution is to get the IT community together, and engage everyone to inspire products that benefit the climate, and communicates to the people in the streets about climate change." The panel is not meant to be a scare campaign about climate change, explains moderator Spencer Reiss, but the panelists are keen to illustrate the real situation of the changing climate. This is also in the interest of insurance companies which have begun to react to the potential dangers that come with storms, floods and droughts. "Afterall millions of people already have to plan to move away from their homes close to the sea", adds President Grimsson. Johannes Meier, jumps on that suggestion and emphasises how important it is for the well-off countries to aid the developing world in any effort to create greener economies. Opening the floor for questions the DLD audience is finding out more from insurance expert Ernst Rauch from Munich Re who points out that the developed countries are still generating more CO2 emissions than the developing world. David Kenny also responds to a disillusioned attendee by saying "don't give up on democracy helping in these problems. As a journalist it's my responsibility to educate also about the weather."